Is The Senate Constitutionally Obligated To Vote On A Supreme Court Nominee? Longer answer: See this interesting post by Ilya Somin, a respected libertarian law prof.
UPDATE (3/18/16): For some other perspectives, click here, here, here. UPDATE (3/22/16): On the question whether “shall” means “must”, click here. Coming Your Way Soon: The Little Book Of Big Appellate Tips! 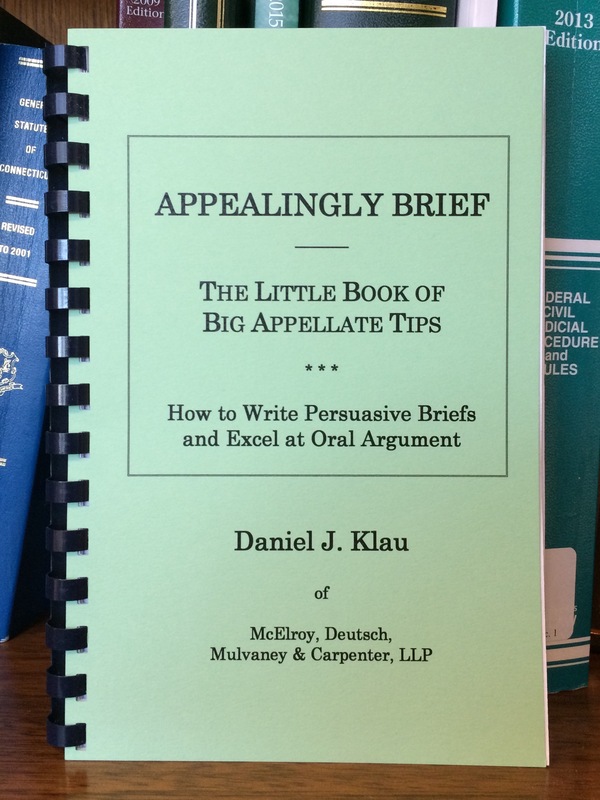 I’m very pleased to announce that I’m on the cusp of releasing my first book, Appealingly Brief: The Little Book of Big Appellate Tips (Or How to Write Persuasive Briefs and Excel at Oral Argument). Click here for more information about the book, including a free excerpt in pdf format. The full book will be published later this fall in both print and e-book formats. The book contains 37 specific tips, many with multiple sub-tips, pointers and suggestions, on brief writing and oral argument. While I would like to take sole credit for these tips, the truth is that they represent the collective wisdom of brilliant jurists and appellate lawyers like former Connecticut Supreme Court Chief Justice Ellen Ash Peters, former Wiggin & Dana appellate guru (and later federal district judge) Mark Kravitz, and so many other very wise folks, including but not limited to former Supreme Court Justices David Borden, Joette Katz, Barry Schaller and Ian McLachlan. Stayed tuned for further information on the official publication date. My fixation on King v. Burwell continues unabated. Recall that the issue in this statutory construction case is whether the text of the Affordable Care Act only permits the federal government to subsidize qualified individuals (by income) who purchase insurance on state-operated exchanges, or whether subsidies are also available to all qualified individuals, regardless of whether they purchase insurance through a state-operated exchange or the federal exchange, www.healthcare.gov. The question on my mind today concerns the efficacy of a strategy that the defenders, the Solicitor General in particular, appear to have adopted in their appellate briefs: leading with a relatively weaker argument followed by a relatively stronger backup argument. The law affords a person the right to hire an attorney to represent him in a civil or criminal proceeding or to represent himself, that is, to appear pro se. But does a person have a right to have a lawyer appear on his behalf in a case AND to enter a pro se appearance as well? Is there a right to “hybrid” representation? A few months ago I wrote a post about a case I had argued in the state Supreme Court in March of last year. The main issue in the case was whether, absent plain error, constitutional error or an issue implicating subject matter jurisdiction, appellate courts can raise on their own initiative (i.e., sua sponte) an issue that neither party had raised below or on appeal, and then decide the case based on that issue. I jokingly characterized the dispute as requiring the Supreme Court to decide whether appellate jurists are mere umpires who decide the issues the parties raise–and only those issues–or whether they are gods who are able to dream up unpreserved issues out of thin air in the interest of doing justice. In light of the recent post on attorneys’ fees and the final judgment rule, I thought I would repost this video-blog entry, one of my first on this blog. The guest appearances by my colleague, Jim Budinetz, and my son (the kid in the back seat of the car), are priceless, IMHO. The Connecticut Supreme Court recently released a decision dismissing an appeal on the ground that it had improvidently granted certification to appeal from the Appellate Court. Such a ruling means that the parties to the appeal in the Supreme Court expended a great deal of time and money for, well, nothing. It also means the justices spent a great deal of time reading the briefs, preparing for and holding oral argument, and perhaps even deliberating about the case for, well, nothing. Final Judgments And Attorney’s Fees, Ctd. Last December I wrote a post about a U.S. Supreme Court case that would consider whether a trial court judgment was final, for the purpose of seeking appellate review, if all issues in a case have been resolved except the issue of contractual attorney’s fees. The Skakel Opinion Ctd.–What Will The Supreme Court Do? With the State of Connecticut having indicated its intent to appeal the trial court decision that Michael Skakel’s attorney, Michael (“Mickey”) Sherman, failed to provide a constitutionally adequate defense for his client, many are now speculating about what the Appellate Court or, more likely, the state Supreme Court will do with the appeal. Will the Court affirm Judge Bishop’s decision, or will it reverse? On Monday, the Appellate Court issued a decision that said I filed an appeal prematurely. Ouch. So, allow me to push back, with respect of course.